ETA: Commercial grade aluminum baking pans make a big difference. I switched to using those instead of the darker non-stick pans (such as Wilton pans), and that eliminated the problem of burning the bottoms of the kouign amman. I know I have said that panna cottas are one of my favorite desserts, at least to order at restaurants. But my favorite baked pastry is definitely the kouign amman. I had been meaning to teach myself how to make them but kept putting it off. Then when I saw a class pop up at Baking Arts with Chef Richard dedicated to the kouign amman, I knew I could wait no longer! There are many very similar recipes online that should all work just fine, so feel free to just search your favorite recipe source. If you just want to know what recipe I’m using (and it’s probably one of the easier recipes), see below. In short, this is like a croissant / puff pastry hybrid. 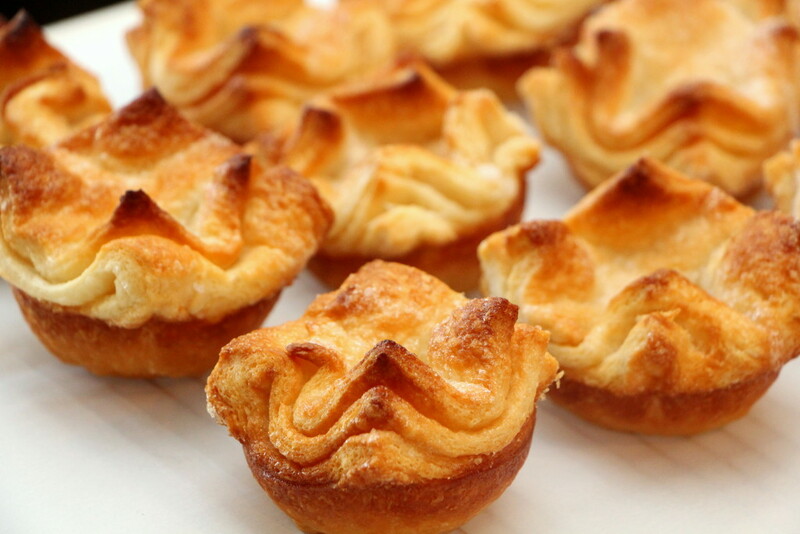 The kouign amman is a laminated yeast-risen dough with sugar sprinkled between layers during the last set of folding. Because the dough is ultimately folded and squished into pastry rings or muffin tins, proofing the dough isn’t a crucial step, and you can use the “quick puff pastry” method of mixing in chunks of butter, instead of the classic croissant or puff pastry method of wrapping a détrempe (dough packet) around the beurrage (block of butter). It’s quicker and more foolproof. 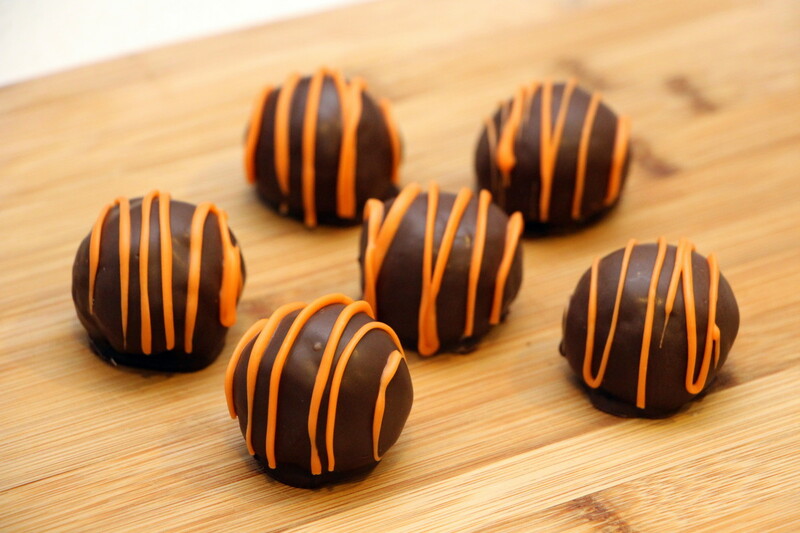 I made these for an office baby shower celebration, with 1/2 standard, 1/4 with orange-zest sugar, and 1/4 with a chocolate hazelnut ganache filling. 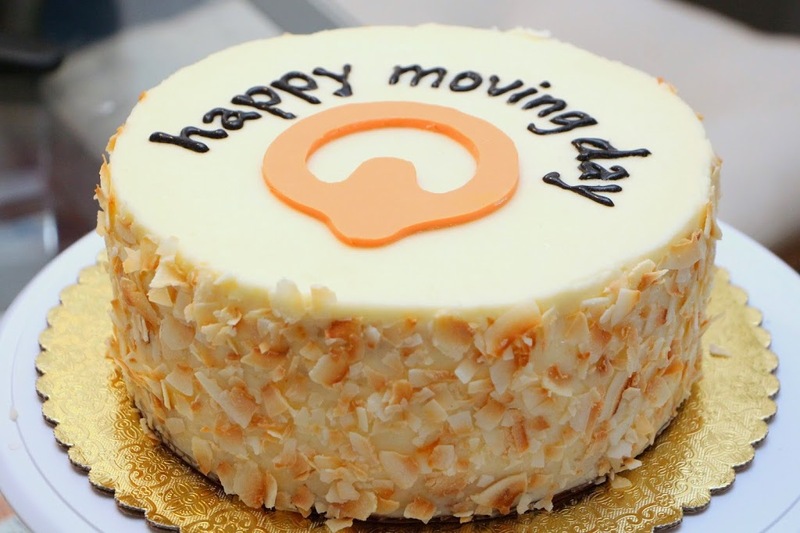 Everything was going smoothly, through the rolling, folding, sugaring, and forming. And then I proceeded to overbake them and burn the sugar on the bottom, despite the otherwise foolproof recipe (that’s what happens when you rely more on the clock than on your eyes and nose). It feels sacrilegious to have blackened my kouign amman, but alas, we all have those days. In any case, if you don’t mind the taste of a dark caramel, they are still yummy! Glad I could share these instead of eating them all myself. Mix salt and flours together. Add in 2 tablespoons of butter and mix well (or rub together with fingers) until no lumps remain. Mix yeast with water and set aside. Add cubed butter to flour mixture and fold/toss. Slowly drizzle on the water-yeast mixture in several additions while gently mixing. When the dough just comes together, pour onto table and shape, pat and roll into an approximately 18″x6″ rectangle. Make a letter turn (fold into thirds). Turn the dough a quarter turn, roll out to the same size, and fold in thirds again. Repeat for a third letter turn. Chill dough for 20-30 minutes in refrigerator. Lightly grease a standard muffin/cupcake pan or pastry rings. Preheat oven to 400 degrees (or 350 degrees in a convection oven). Sprinkle work surface generously with sugar. Complete last letter turn, sprinkling with sugar before folding. 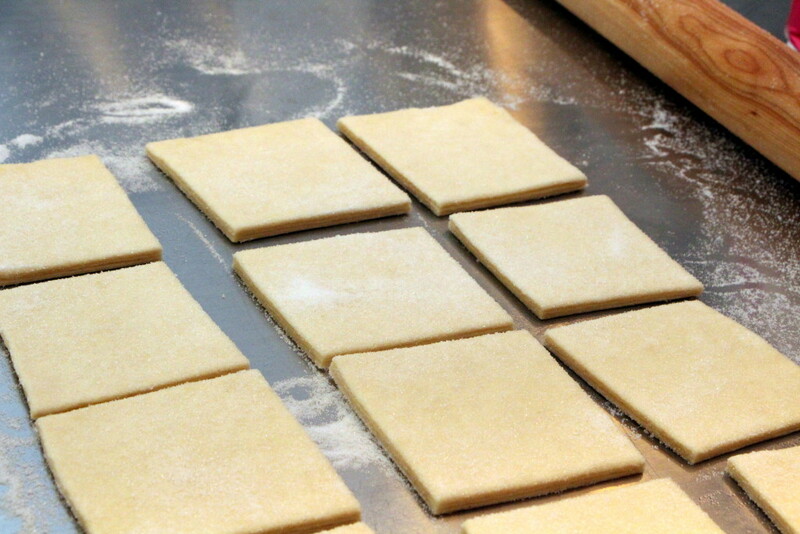 Roll dough into a 12″x16″ rectangle and trim edges. Cut into twelve ~3.5″ squares. 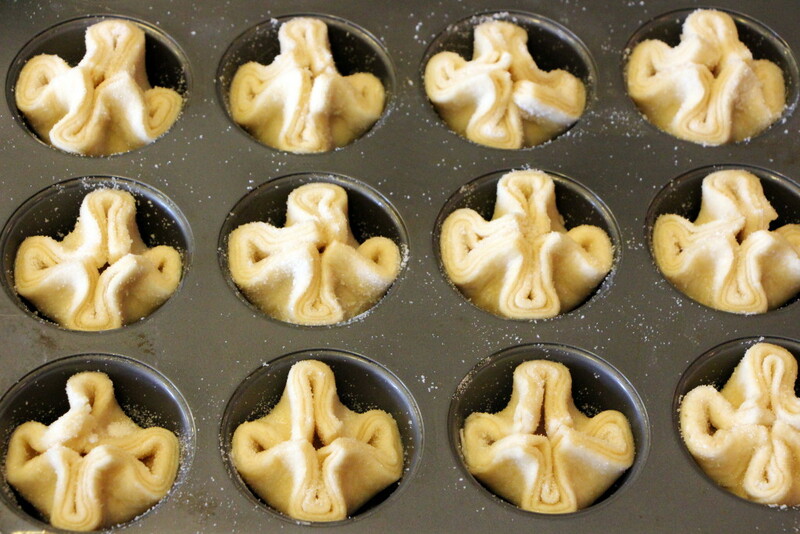 Fold up the corners of each square and place into prepared muffin cup. Sprinkled with any remaining sugar (and salt, if desired). Let rest for 10 minutes in refrigerator. Proof dough at room temperature for ~30 min. Bake for about 35-40 minutes, rotating every 15 minutes, until browned. 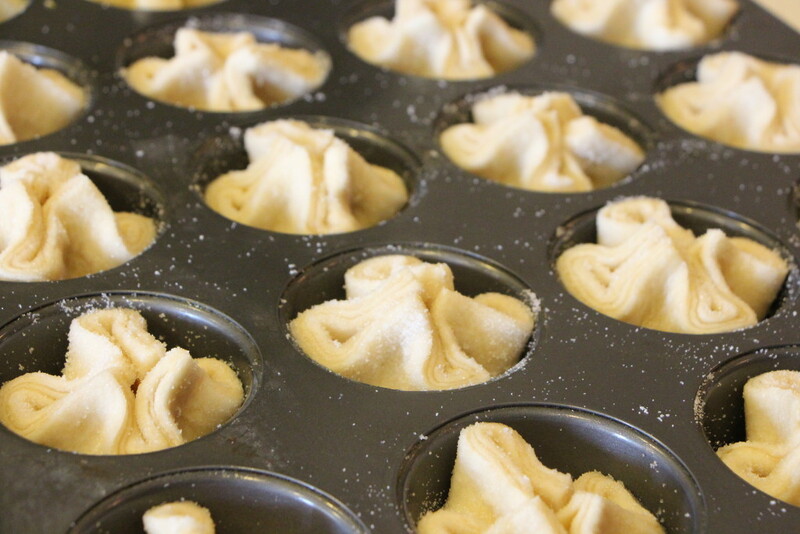 Remove the kouign amman from tins immediately and let cool on parchment. 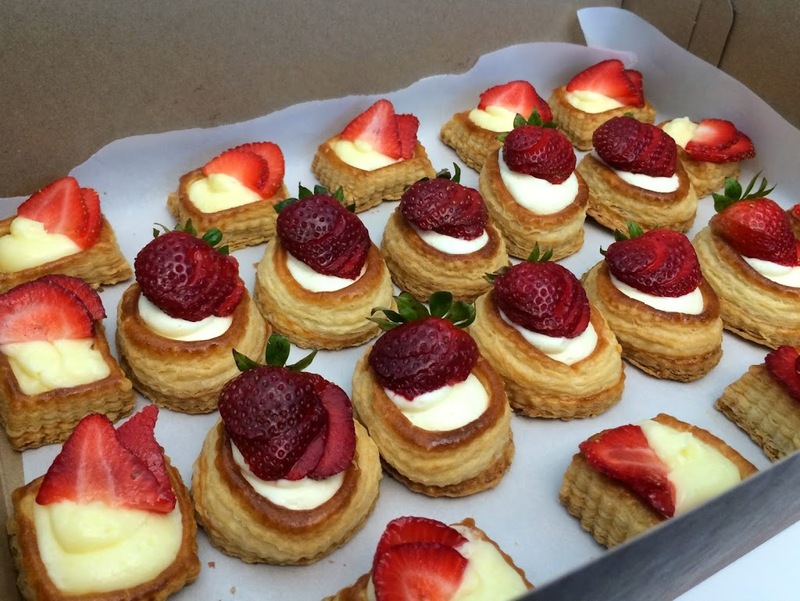 « Strawberry Pies & Tarts – Happy 4th of July!